Play Fire N Hot Slot Online with 500 Free Spins! 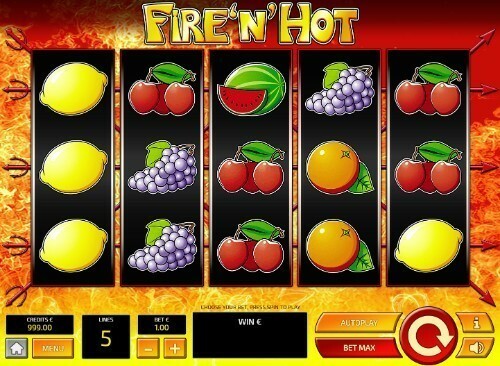 Fire N Hot is a 5-reels, 5 paylines Online Slot Game by Tom Horn Gaming. Fire N Hot has Wild symbols feature and an RTP of 95.74%. Visually, Fire N Hot online slots game makes you feel as if you are happily rocking out in a hell-like inferno. Nothing but billowing flames burn in the backdrop and the reels are surrounded by pitchforks. The reels themselves contains classic retro style fruit. The lucky 7 acts as the only high-value symbol and there is also a yellow lucky 7 Wild and a star Mystery Scatter. Of lower value are the fruits: a watermelon, a bunch of grapes, plums, an orange, a lemon, and cherries. Scorched fruit can still taste sweet when potential big wins are involved. The graphics are in bright and colourful cartoon illustrations. Upon wins, the symbols can burst into flames. While there is no background music, cheerful chimes and jingles upon wins enhance the excitement of gameplay. You can grab your fire suit at Rose Slots, so you can play Fire N Hot online and experience wins of real money that is not too hot for you to handle. The talented developers at Tom Horn Gaming must have had the Air conditioning or fans on full blast when designing the fiery gameplay of Fire N Hot online slot. Based in Malta, Tom Horn has built a reputation for creating titles with immersive visuals, exciting bonuses, and overall fun and engaging gameplay. Players of online casino UK will be happy to find many of their games at RoseSlots.com including ‘Don Juan’s Peppers’, ‘Blackbeard’s Ques slot’, ‘Savannah King’, ‘Feng Fu’, and ‘Book of Spells online slots game’. Fire N Hot online slot has straightforward and easy gameplay that you will be saying is a perfect ‘match’ for you. With a simplistic 5 reels, 3 wager rows, and 5 paylines, you may excitedly be juggling fire and generous payouts. The yellow lucky 7 Wild replaces all other symbols, except Mystery Scatter star, to complete wins. If 5 of lucky red 7 appear on the reels, the highest value win of an 800x multiplier is awarded. With a win like that, you will definitely be ‘feeling hot hot hot’. 5 of the watermelon will cool you down with a still impressive 120x multiplier of your total bet. Fire N Hot slot has a flexible betting range from 20p to £100. If you need to take a walk and cool off from the hot gameplay, set the AutoPlay for 5 to 100 uninterrupted spins. The Bonus Feature is triggered when at least 3 Mystery Scatter stars appear on the reels. These stars then reveal a matching icon that awards a prize. Up to 5 stars can appear on the reels and this could create an exciting payout.